MAHENDRANAGAR, Dec 31: The government is all set to transfer one-horned rhinos, a rare and endangered species, to Shuklaphanta Wildlife Reserve, Kanchanpur from Chitwan National Park. 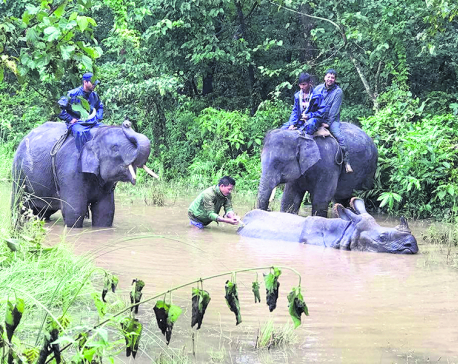 Gopal Bahadur Ghimire, assistant conservation officer at the Reserve, said the government has already decided to transfer five rhinos to SWR and 20 additional rhinos to Bardiya National Park. A secretary-level meeting had taken decision for translocation on January 14, 2015. The Department of National Parks and Wildlife Conservation has recently written a letter to Suklaphanta Wildlife Reserve to make necessary preparations for the translocation. According to Ghimire, the department has already informed the reserve about the translocation of rhinos through a letter on December 12. "Various initiatives have been taken for choosing proper habitat for the existence of rhinos. We have also told them to manage financial and technical requirements needed for the translocation," he informed. Shuklphanta Wildlife Reserve has also written a letter to National Trust for Nature Conservation (NTNC) and Shuklaphanta Conservation Program for financial help. According to Anil Prasai, chief of the Conservation Trust, they have already received the letter from the reserve and now they are focusing on other proceedings. He also informed that the reserve has already chosen appropriate place for the rhinos' habitat. Earlier in 2001, four one-horned rhinos were transferred to Suklaphanta Wildlife Reserve from Chitwan National Park. In 1995, a local one-horned male rhino was found in the reserve and then it was realized that this could be a perfect place for translocation of rhinos. Now, the number of rhinos has increased to ten in the reserve.